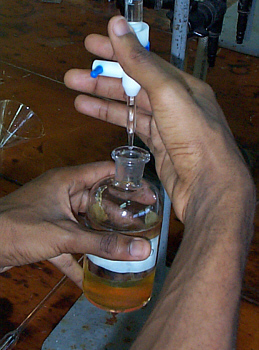 Determination of available iodide by Andrew's titration. Experiment 11. Determination of available iodide by Andrew's titration. In experiment 9, potassium iodate, when used as an oxidising agent was itself reduced to elemental iodine. However, if the reagent is used in the presence of an excess of concentrated hydrochloric acid, the reduction product is not iodine but iodine monochloride, where iodine is formally in the +1 oxidation state. Hence the overall reaction is as shown below, and the end point may be readily detected by the disappearance of free iodine and its replacement by the pale yellow colour of iodine monochloride. Either (i) weigh out accurately between 0.08 and 0.15 g of the solid `I' into a 250 cm3 glass stoppered bottle (clear glass), or (ii) pipette 10.00 cm3 of solution `I' into a 250 cm3 glass stoppered bottle. Add about 25 cm3 of concentrated hydrochloric acid (use a graduated measuring cylinder) and 5 cm3 of carbon tetrachloride. If (i) is used shake well to dissolve the solid. Titrate the test solution with your standard potassium iodate solution, shaking the bottle frequently. Initially the lower (non-aqueous) layer becomes deep violet due to the formation of iodine but this becomes paler near the end point. When the violet colour is only faint the addition should be made dropwise and the bottle should be frequently shaken in order to concentrate the iodine in the non-aqueous layer. The end point is the point when the violet iodine colour just disappears. Repeat the titration using a second sample. 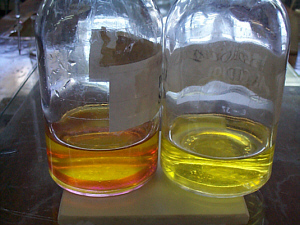 Finally a `blank' titration must be made by placing in the bottle hydrochloric acid and carbon tetrachloride only in amounts, identical to the above procedure, and noting what volume, if any, of the iodate is required to produce an end point, i.e., to give firstly an iodine colour and then a yellow/colourless non-aqueous layer. (b) the concentration (g /dm3 ) of iodide ions in the solution. 2. If a solid was used, then that solid was the iodide of a group one or group eleven metal, i.e, MI. Use the percentage iodide obtained above to identify M.
The worksheet for this experiment is available as an Adobe PDF document. The original Experiment probably dates back to the laboratory manual devised by Dr W.G. Bartley but since then it has been revised over the years by numerous members of staff at UWI.